Sometimes the hardest part about coming up with a recipe in your head is naming it. You're looking at that situation with this very post. You see, this recipe was spurred by our Advent Calendar. Yesterday, the Advent Calendar Activity was to create a Peppermint-y Sweet Treat. On Saturday night, Katrina got to choose our dessert and she wanted something with chocolate and peppermint so we created a rice crispy bark concoction - but I still wanted to stick to the advent calendar activity for the day so whilst I walked around the park, I got to thinking. Well actually... first I dodged a giant tree that came falling down in front of me. But it seems like narrowly avoiding death is good for my brain because about a minute or so after that tree fell just two metres in front of me, I came up with this recipe! I first thought about making cookies, but then I thought about fudge - so I decided to combine the two! 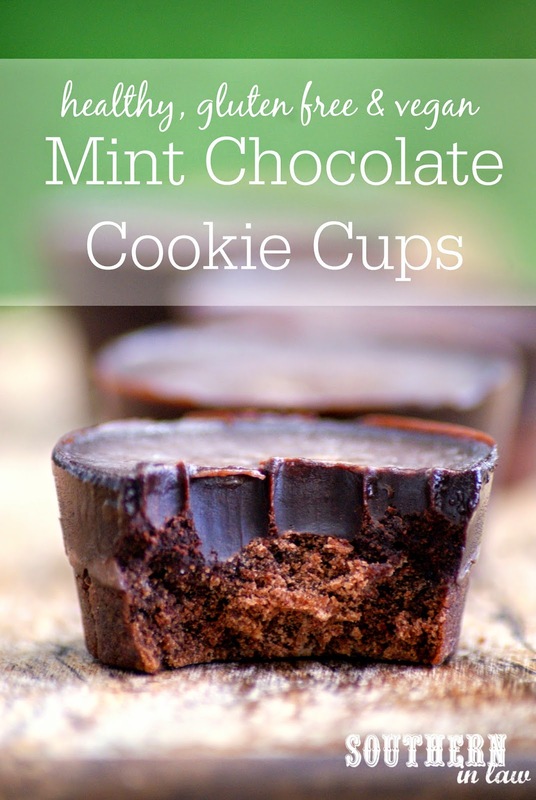 A delicious chocolate cookie base with a melt in your mouth mint chocolate fudge topping. The ultimate peppermint-y treat in my mind. But then I set myself a challenge - this recipe, of course, had to be healthy and gluten free - but I also wanted it to be vegan and refined sugar free as I feel like my vegan friends have been missing out on the blog this Christmas! (I'm sorry! Is this an okay peace offering?!). Jesse doesn't actually like mint chocolate, however, he loved these and decided they tasted like the ultimate Healthy Thin Mint Cookie (being an Australian, I was already thinking they were the ultimate Healthy Mint Slice Biscuit ;P) thanks to the crunchy cookie base and thick mint chocolate fudge layer on top. But whatever you want to call them, they're delicious! And the perfect healthy treat to make this Christmas - or anytime you fancy! 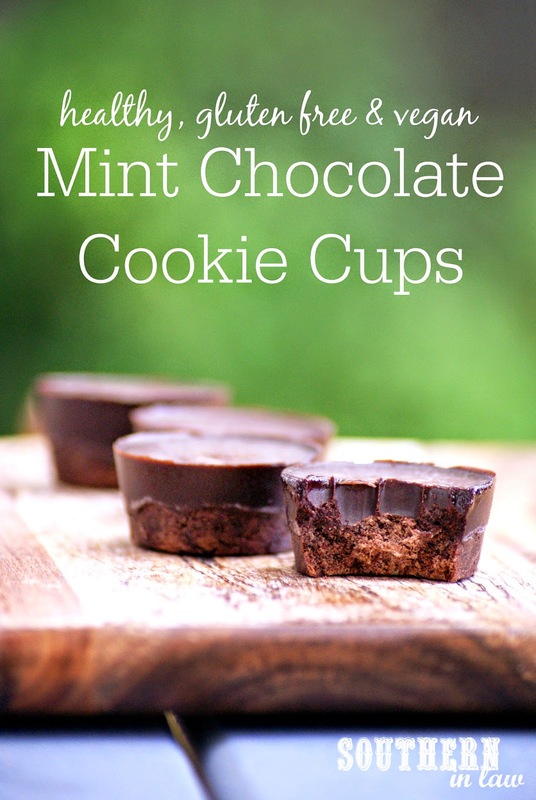 Because they're baked in a muffin tin, they're also super easy to make - no annoying dipping or coating and getting chocolate all over the place - just pour it right in! So let me give you the recipe so that you can make them yourself! Melt your coconut oil with your maple syrup and water either in a heat proof bowl in the microwave or over the stove (it will literally take just a couple of seconds). Add in your flour, cocoa powder, baking soda and salt and mix to combine. Divide your cookie dough amongst your prepared muffin tins, flattening the dough to form an even layer that covers the base of each muffin hole. Bake for 10 minutes and remove, allowing your cookie bases to cool in the muffin tin. After your cookie bases have cooled for about 15 minutes, make your fudge mixture by mixing all of your ingredients together and heating them over a low heat (or in the microwave for 10-20 seconds) whilst stirring to incorporate all of the ingredients into a smooth mixture. You really only need to melt the coconut oil so it will be a quick process! Once your mixture is smooth, pour about 1/2 tbsp - 1 tbsp mix over each of your cookie bases (whilst still in the muffin tins of course!) and then place your muffin tins into the fridge to set. 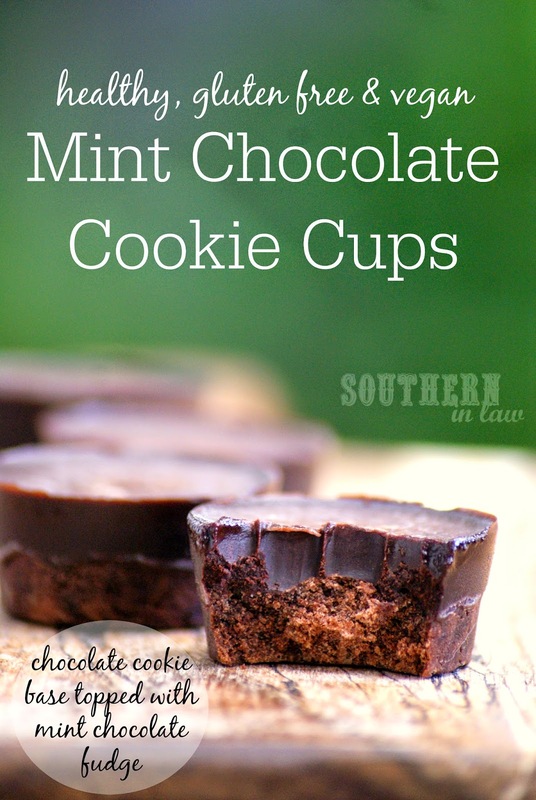 The cookie cups should set in around 1/2 an hour but it may take longer depending on your fridge. They're ready to eat once they're firm to the touch and you can easily remove them from the tins! *If making these gluten free, be sure to check your cocoa powder as some contain gluten! But tell me, do you ever struggle to name what you bake/cook? Or do you tend to stick to classic recipes? That's it...I'm declaring you the dessert queen! I love all the fruit at Christmas, but I also can't go past a big piece of Mum's duck egg, double cream caramel tart. White Christmas Slice I make it every year and I think I eat more of it then the kids! I love a gingerbread house so beautifully decorated with mouth watering sweets! There it sits on my table for a month teasing and taunting me until Christmas day when I take great pleasure in demolishing it's deliciousness!! Now following you on Instagram as @allaglow. Is the cocoa powder for the fudge topping unsweetened also? Looking forward to making these this week!